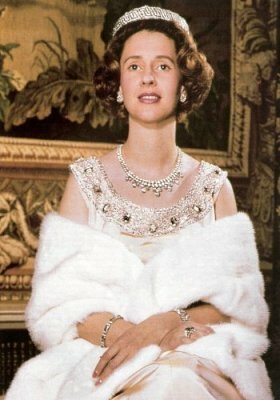 For royal ladies** such as Queen Fabiola of Belgium , there is nothing wrong with looking pretty and elegant. "I stand for poofy dresses, flowers, ribbons, and all that is girlie!" While "feminine" simply means "any attribute associated with women", culturally, the term also means the traits that are expected of women to perform and have, encompassing things like beauty, grace, elegance, and good social manners. Unfortunately, the latter often involves things like demureness and timidness, which has also led to women being expected to be weak-willed and fragile, while bringing rejection and ridicule to those women who fail (or refuse) to comply. And, of course, some women take advantage of these associations. Regardless of the exact form (such as whether one is "girly", "lady-like", or "matronly"), these are the tropes about femininity.